Add foreign language credits to your child's homeschool transcript with LIFEPAC Spanish I for grades 9-12 from Alpha Omega Publications! This full-color course is exclusively designed to build Spanish skills through dialogue and conversation practice. Afraid you can't teach a foreign language? Don't be. This fun course has easy, step-by-step lessons and simple explanations every parent can follow and your child will love learning Spanish with easy-to-follow, self-paced lessons! To encourage student learning, LIFEPAC Spanish I is divided into ten motivating worktexts, and personalized instruction along with consistent reviews ensures concept mastery. Topics covered include vocabulary related to school, home, numbers, months, seasons, time, and clothing, parts of speech, and the culture and geography of Spanish speaking countries around the world. Filled with creative lessons, LIFEPAC Spanish I builds beginning skills in reading, writing, and speaking the Spanish language. In addition, audio CDs, give your student the opportunity to hear Spanish speakers actually using various words and verb tenses! LIFEPAC Spanish I also comes with a must-have teacher's guide filled with teaching ideas, supplemental activities, outlined objectives, and answer keys. Most importantly, after your student has completed this ten-unit, one-year course, he'll be able to ask and answer basic questions and respond to simple statements in Spanish! Don't fret over those elusive foreign language credits any longer. 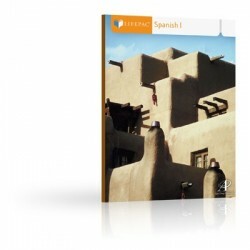 Order LIFEPAC Spanish I today.